If you have a child whose birthday falls on or around Valentine's Day, we have a Valentine's Day Party that your little sweetheart is going to love! In fact, this party is so sweet, you will want to throw it even if it's not your child's birthday. One of the best thing about this party is...there's no birthday required! Our sweet little Savannah really enjoyed our last Valentine's Day party as you can see in the photo above. In fact, she found herself a sweetheart! Too cute! As with most of our parties, we start with a theme party supply kit like the ones below and add on to it with whatever we can dig up around the house and some special splurges as well. The sets below are both from Celebrate Express, one of our favorite sources for party supplies. Celebrate Express (a sister company of Birthday Express) usually has a deal on shipping like free shipping over $75. They have a nice selection on party products and great prices as well. Not only do we have creative contributions for those but also some innovative ideas for your outside-the-candy-box party too like Valentine's Day Parties for Boys and Valentine's Day Parties with your child's favorite character like Spiderman or Mickey Mouse. You can also add a second theme like Candyland or Princess to double the fun! We are a family who loves parties so through the years you can bet we have put on plenty of Valentine's Day parties so keep reading to check out some of our tried and true tips. What's black and white and read all over? A newspaper...and...these Valentine Party Invitations! Simply fold a piece of red card stock or construction paper, and cut a half a heart. Open the heart up into a whole heart and print the party details or better yet, let your youngsters write them. Help him or her decorate the heart with glitter paint pens then fold and slip into an envelope. Sprinkle in some confetti and seal the deal with a heart sticker. Or, you can go all out and customize an invitation such as the one below one from Tiny Prints. There are lots of designs to choose from like this one that would be especially nice for a Valentine Costume Party. Be sure to add any special instructions such as RSVP or "wear red if you can" and it's a good idea to include a map! Be sure to mail them with plenty of time to spare. Of course the typical colors for a Valentine's Day Party are red, pink and white but in no way is a party limited to those colors. Red and blue are really swinging colors for a Spiderman Valentine's Day Party. Shades of blues or purples and pastels are great too. We like to welcome our guests right when they drive up by way of a sign in the front yard and a banner across the doorway. You can even order a personalized photo banner at Celebrate Express...how cool is that? May your heartprints lead the way...literally! For one of our parties, we cut red hearts out of posterboard and printed little sayings on them like: "Be Mine", "Hugs" and "You are Sweet". We laid a trail of hearts from the front porch to the family room where the party was. The guests followed the hearts to join the fun. For those of you who are short on time, you can pick up a package of precut hearts like these from from Shidigz and write on them yourself or even leave them blank. We got most of our Valentine's Day Party decorations at Shindigz, in fact. Of course use them year after year. The prices are terrific and they are always running some kind of a special. Shindigz is a family owned business that is fully equiped to supply large events such as proms, weddings and banquets so we always know they will have all the frills we are looking for. If you haven't clicked on to take a look at their Valentine selection, you simply must! You are in for a real treat! One of my favorite purchases from Shindigz is the fringe I hang in the doorway at each and every Valentine's Day Party we throw so that the guests walk through it into the party area. It's a "wow" factor and it's always a kick to watch the expressions because we always do our best to make the room really fun and festive. Love, love, love these Dangling Swirls! And check out this romantic Balloon Archway that makes a perfect photo prop. The Candy Heart Arch is great too because you can have the top heart personalized, again, awesome for a birthday message. Talk about sweet...these Candy Heart Decorations rock! Hang some from the ceiling, stand a couple on the floor and this is the coolest thing ever- you can have them personalized as well. Especially if you are throwing a birthday party, it is a great way to shine the spotlight on the birthday boy or girl. Let the birthday child know that she (or he) lights up your life when you personalize this Lighted Heart! Or, if your party is strictly Valentine's Day, you can say whatever you want on it. Again, this fun item is from Shindigz. Although most of our larger decorations came from Shindigz, we ordered our party pack fromn Celebrate Express and couldn't resist some of the extras they had available like these fun frills. Add a sweet air to your Valentine's Day Party! Balloons are a must at any party but especially for Valentine's Day. We usually mix themed mylars with solids and tie curling ribbon to them to fasten them to chairs, hang them from the ceiling and anchor them to theme toys or whatever we have around. We even make balloon bouquets for the tables. Pinatas are always a hit and are not only fantastic for decorating but double as a fun game too, one time that a broken heart is a good thing! Bring in any additional theme while you are decorating and continue it throughout the entire party. Games, snacks, the cake and even party favors can be coupled into one sweet combo. Simply find a second theme then mix and match things you especially like from it with our Valentine's Day Party ideas. Mickey Mouse is fits right into the Valentine flow and Minnie is so sweet, add a few pastel heart decorations to Minnie or red and blue hearts with Mickey and you're good to go. Angry Birds are even seeing red for the holiday! It's true, they are having so much fun at the party, they aren't even mad anymore. Check out our Angry Bird Bird-day Party ideas and add some of our Valentine's Day Party touches and your party is sure to be a winner! Not only are we a family who loves to throw great parties but we are extremely into sports as well. With two College Soccer Coaches, an Extreme Sports Endurance Racer and a Karate Instructor in our group, many a Sports Theme Valentine's Day Party has played out in our family proving that any theme can be mixed and matched with Valentine's for a red hot party! We scored on Sports party supplies at Birthday in a Box. We love decorating tables so we've got cha covered when it comes to funtastic ones that will add color and theme to your party scene. Of course you can go with just one central table for everything but we like to go all out and use as many as we can like one for the food and snacks, one for the cake, one for beverages, one for guests to sit at and for the Valentine's Day Party theme, we designate one whole table to candy. Sweet! Start with a table cover. You can use all themed ones or go with a solid like red, pink or whatever your main color is. Or, you can do like we usually do and mix solids and theme ones. Once you have the table cover on, the fun begins. You can add some lace, tulle or string of heart lights around the table tops for a very dramatic, romantic effect then you will want to add a centerpiece. You can easily find Valentine's Day Party centerpieces or you can also make your own. Bunch some Valentine balloons together, tie a curling ribbon on and anchor with a plush like this adorable little Valentine Bear or a heart shaped cookie cutter and you have a centerpiece on a shoestring, or rather, curly string. We usually purchase a special centerpiece or two and make the rest of them. You will want at least one thing with to add height to each table and a centerpiece is a great place to start. I sometimes even set a centerpiece on a box that I wrap in color coordinating wrapping paper. Next, place the drinks in the beverage table, cake on the cake table, food on the food table and so on. Don't forget the plates, cups, napkins and eating utensils! It is important to make sure you have plenty of room for the essentials before you decorate any further but once you see how much space is left, set some fun things around like Valentine plush toys, a vase of roses, hearts of any size or shape, etc. Let your imagination run wild and you will amaze yourself. And by the way, remember you can always enlist the help of your little sweetheart! Now that you have your tables set and decorated, it's time to add a sweet touch for the final flair. Sprinkle around some Valentine confetti, heart shaped candies, conversational heart candies, rose petals or Red Hots. You can use the same sprinkles for all the tables or vary them. There are no rules so just have fun. OK, there you have it...breathtaking tables that will add wonders to your decorating scheme. 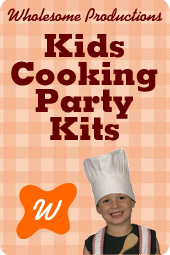 Rest assured the children will get hungry at your party so feed them some fun food the are sure to love. If your party falls on or around mealtime, be sure to include some more filling dishes along with plenty of our yummy snacks. Although this pizza is totally homemade, don't let that dishearten you... it's actually a cinch to make and oh so good! 1. Preheat oven to 450 degrees F (230 degrees C). In a medium bowl, dissolve yeast and sugar in warm water. Let stand until creamy, about 10 minutes. 2. Stir in flour, salt and oil. Beat until smooth. Let rest for 5 minutes. 3. Turn dough out onto a lightly floured surface and pat or roll into a circle then form into a heart or use a Wilton Heart Shaped Pizza Pan . (The pan can also be used for a giant heart shaped cookie too!) Transfer crust to a lightly greased pizza pan or baker's peel dusted with cornmeal. Spread with desired toppings like pepperoni, hamburger, sausage, Canadian bacon, and bake in preheated oven for 15 to 20 minutes, or until golden brown. Let baked pizza cool for 5 minutes before serving. Dig out the center with a spoon and fill with the dip of your choice. Set the bread on a red platter and garnish with lettuce leafs then arrange carrot and celery sticks around with other sliced veggies. This is a cute and delicious dish that will disappear before your eyes! Use cookie cutters to shape prepared sandwiches into fun heart shapes. Use peanut butter and jelly, chicken salad or deli meat and cheese to fill them. Fruits and veggies are good heart food, literally. Please the kids and parents alike with this great dish. Arrange veggies on one tray like carrot and celery sticks, sliced cucumbers, brocolli spears and any other veggie you like. Serve with ranch dressing on a heart shaped tray or even a color coordinating solid one. For the fruit tray you can slice up apples, bananas, oranges and kiwi. Add some cherries, grapes and berries too. Serve on a fun tray with a pink yogurt dip. Dreams of sugar plums are dancing in their heads and nothing says Happy Valentine's Day like candy, cookies and cake. So let them satisfy the old sweet tooth in style with these sweet treats that would make even Willy Wonka a bit envious! As you are preparing the goodies, don't forget to let your child join in the fun. Be patient with your little baker in the making. Learning to bake is progress, not perfection. Remember, baking memories is what it's all about! My daughter, Jamie and her husband, Scot made these adorable cookies. Don't you just love them? Start by making your favorite cookie or use on of our great recipes. They used shortbread cookies for these. Once your cookies have baked and cooled, roll out fondant and cut into desired shaped and carefully lay on the cookies. Don't be afraid of fondant, it is not as hard to work with as it may seem. You can use a pattern to cut your shapes if you aren't so good at freehanding it. Another fantastic option for those who need a little help is the Cricut Cake Machine. Although it is a bit of an investment, think of all the parties and events you will use it for and how many cakes, cookies and other delicious sweets you can make. Your creations will look like a professional made them and your guests will be "wowed" for sure...trust me! Cake pops are all the rave if you haven't noticed. They are so cute and delicious and kids just crazy about them! You will need: cake balls, sucker sticks, Wilton candy melts (red) and heart sprinkles. You can make cake pops several ways. My favorite way is with a Babycakes Cake Pop Maker because it's so simple. While the cake balls are baking, melt the candy melts according to the instructions. Do not overcook or they will be ruined. Once you have made your cake balls, dip a sucker stick in melted candy melts so that it sticks better. Stick halfway through the cake ball and let set. Dip the ball into a bowl or cup of melted candy melts and swirl around. If you have trouble keeping the ball on the stick you can pour the melted candy melts from a large spoon and cover half. Let sit for a few minutes in the freezer until the candy is hard and then complete covering the ball. Add another layer to ensure it is smooth and fully covered and before the candy coating sets, place sprinkles on. When the suckers are fully dry, slip them in cellobags and tie each with a curly ribbon. There are lots of fun ways to display your cake pops. We put styrofoam in a long white basket and covered it with red foil basket wrap and them stuck the cake pops in it for a really nice effect. FOR THE LOVE OF SUCKERS! The kids will love these suckers! Simply melt Wilton Candy Melts in the color and flavor of your choice and pour into one of these Valentine Lolly Pop Molds. Lay the stick in carefully. Let set until hard and gently turn over so that the sucker falls out without breaking. Wrap in cellowrap or slide into a cellobag if desired. Tie with a color coordinating curling ribbon. This is another great way to blend in your second theme. If you are using Mickey Mouse or Mickey Mouse Clubhouse, these are down rat loveable! Any Valentine's Day Party deserves a great candy buffet! Set up a "candy counter" that will give the little sweeties all the candy their hearts desire and they will be as happy as...kids in a candy store! We set up an entire table for the Sweet Shoppe. In fact, we pulled two card tables together and covered them with one large red table cover so it looked like one huge candy bar! Fill clear jars with candies and set out little scoops to dish out the goodies. We provided cellophane Valentine themed bags for the children to store the treats in. We had tons of red and pink candies along with pastel converstional hearts, sweet tarts, bubble gums and chocolates. You should have seen the looks on the kid's faces when they lined up to go through Candy Heaven. It was priceless! If you are so inclined to do so, you can get fancy and label each with a fun Valentine twist. We cut hearts out of craft foam and printed sayings on them such as "Red Hot For You" for the Red Hot candies and "Don't Snicker...I Love You" on a jar of minitature Snickers. "You Drive Me Nuts" was on a jar of mixed nuts and "You're Beary Sweet" was on the Gummy Bears. One really cute idea is to spray paint the lids of the jars in pink or red or whatever your main color is. When the paint is dry, add a puffy Valentine sticker on the knob in the center. You certainly don't have to limit your "Candy Bar" to candy. Set out small cups or bowls of ice cream or yogurt for the children to sprinkle candies on. You can do the same with cupcakes too! Of course we couldn't leave out the traditional box of chocolates so we set out one huge box and also scattered mini versions out on the table. If you are doing a second theme along with the Valentine's Day Party theme, the Candy Bar is the perfect place to blend the two. Candied footballs or soccer balls, Mickey Mouse suckers (instructions below), a Candy Land mecca,...even Spiderman goodies all can mix right in. Set Mickey and Friends plushes around the table or lay out the Candy Land board game to add even more of a funtastic flair. If the theme is strictly Valentine's Day, you can add some huge Hershey's Kisses and Candy Plushes to sweeten up your banquet table. We ordered most of our candies from Amazon. While we were ordering, we picked up our jars and scoopers for a steal of a deal! Shopping on Amazon was convenient and actually very cost effective. Check out some of our favorite candies and supplies! The finale of any party is of course...the cake! Cake time is most kid's favorite part of the party so be sure yours is made from the heart and is all it's pumped up to be. This gorgeous cake is much easier to make than you would think. Simply bake your favorite cake or use one of our cake recipes. Invert the cake on a serving dish when cool and then cover with a sheet of white fondant. Use a sheet of light pink fondant to cut out a heart shape. You can use a heart shaped cookie cutter if you want to. Do the same with a dark pink sheet of fondant. You can tint and roll out your own fondant or buy the precolored. Dot with jumbo dot confetti sprinkles and tie a ribbon around the cake and tie in a neat bow. This cake is made with the ever-so-versatile Double Heart cake pan from Amazon. My sister bought this pan years and years ago and we have used it for so many occasions it's unbelievable. Not on for most every Valentine's Day, we have baked cakes in it for numerous birthdays, baby and wedding showers. Bake your favorite cake and frost as desired...that's it! One of my favorite ways to make this cake is to top with frosting and then fill in the heart shaped crevise with blueberry pie filling. You can also use strawberry or cherry. If you are looking to make a cake and to make a delicious investment...you can have your cake and eat it too with this pan. Show your cupcakes off on this super sweet cupcake stand. It will add height to your dessert table and makes it easy for the guests to grab them too! The little sweethearts will work up quite a thrist having fun at the party so be sure to serve drinks that are sure to bring a smile. Slices of red fruits, such as strawberries, raspberries, cherries, cranberries and so on. Mix all the ingredients in a punch bowl and serve chilled. Add heart shaped ice cubes or a Valentine's Day Ice Ring. Try adding heart shaped ice cubes. (Make cubes in heart shaped muffin pan.) Make it more festive by serving in Valentine themed glasses or pink/red glasses. Try looking in local dollar stores for themed glasses. Mix all of the ingredients together and serve chilled. Pour into punch bowl and decorate with an ice ring or heart shaped ice. This yummy punch is great for showing off your ice block or ice ring since it is light colored. You can substitute pink lemonade for the regular lemonade if you want a light pink champage look instead. Blend together in blender and serve immediately. Blend the first four ingredients in the blender and pour into serving glasses or cups. Top with whip cream and garnish with pink sprinkles. The children will love chillin' with these fun ice rings. You will need a freezer safe heart shaped dish. Fill half full with water and freeze until hard. Add conversation hearts, red hots, red or pink sprinkles or rose petals and fill the rest of the way with water. Freeze until fully frozen the set the bottom in lukewarm water until the heart shaped ice easily comes out. Fill punch bowl with punch, slip the ice ring in and serve immediately. This was a huge hit at our party! You will need a square shaped, freezer safe container. You will also need a non-toxic plastic heart. Partially fill the square container with water and freeze. Lay the heart on the ice and fill with more water and let freeze then fill the rest of the way and freeze until the entire block is frozen solid. Let lukewarm water run on the sides until it loosens up enough to release. Pour punch in a bowl and slowly lower the ice block into the punch. Serve immediately. Have some light hearted fun with the drinks when you plop in some of these led lighted heart ice cubes. Watch the children's faces glow! Ice Breaker games are played so the children can get to know each other and warm up to the party. We always play one or two of the games at the beginning of the party and others later on. Divide the group into two equal teams and let them each pick a name such as the "Sweet Tarts". Give each group a list of Valentine related items that you have hidden around the house or room before the party. The first group to find all of the items wins the game! Prior to the party, make or purchase medium to large size paper hearts. Print cute Valentine's Day sayings on them like "Be Mine", "Sweetheart" and so on. Cut the hearts in half using a zig-zag pattern or zig-zag scissors. When it's time to play the game, give each child half a heart. If the group is uneven, you can play to even it out. Have each child find their "other half" without talking. Let the children spend five minutes getting to know their "other half" and then gather the players in a circle and let each child say something about their "other half". Have the children sit down on chairs or on the floor. Start the game by saying, "Stand up if you have ever eaten Valentine candy." Continue the game by asking if they have done other Valentine activities that come to mind like if they have ever "Gotten flowers for Valentine's Day" or "Watched a Valentine's Day movie". Place a package of Conversational Valentine candies in a bowl and let each child take a turn picking a candy (without looking at it) and acting out what is written on it. The other children will try to guess what the candy says. Whoever is the first to guess correctly gets to pick a candy and the game continues until each child has had a turn. Before the party, hang a wire "clothesline" across the room. You can make it with a string or thin ribbon if you prefer. Make or purchase paper or foam hearts. On each one write something silly to do like, "Pat your head and rub your tummy". Pin each heart on the line with a clothespin. At gametime, each player will take turns picking a heart off the line and doing what it says to do. The kids will be laughing and warmed up in no time! Kids love games so be sure to organize some for your Valentine's Day Party. As you explain the rules of the games, remind the players that it's not about winning, it's about having fun. We like to give a bigger prize to the winner or winners and smaller consolation prizes to all who participate. Bee Mine! This game is all the buzz! It's easy enough for the little tykes but the older children like to play it to. It is played like the classic "Pin the Tail on the Donkey Game" and includes a Bumble Bee Includes Poster, 1 dozen hearts, 1 blindfold with elastic strap and directions. Just like the old school game, the player that gets his or her heart closest to the correct spot wins the game. If the children are older, you can spin them around a time or two to make the game more difficult. You can make your own version by printing out a picture of a bee and cut out your own hearts and use double-sided tape on the backs of them. A long sock or bandana makes for a good blindfold. We purchased ours from Amazon. It's is very inexpensive and we opted for "quick and easy" on this one. Prior to the game, place a small sticker on the bottom of each duck indicating what prize it will earn. Prizes can be a sheet of Valentine's Day stickers or any little toy or candy you choose. Since we live where it is really cold on Valentine's Day, we don't actually put the ducks in water just in case the children were to get wet and...they would! We had a Splash Table so we filled it with blue shredded cellophane, the kind used as filler in gift baskets. Let each child have a turn picking a duck then check the bottom to see what prize he or she gets. We gave each player the duck they choose and a prize. Divide the group into two teams. A great way to do this is have the children number off, "one, two, one, two" and all of the "ones" are on a team and the "twos" are on another. For this great game, you will need a bag of Converstaion Valentine candies and each player will need and a small cup. A dixie cup or disposable coffee cup works great. The two teams will line up, cups in hand and an even amount of candies will be put in the cup of the first player on each team, enough to partially fill the cups. Then, one the count of three, the first player on each team will pour the candies into the cup of the player behind him or her, as fast as possible. The team to finish first without any candies being dropped, wins. If even one candy is dropped, that team must start over. Divide the group into two teams. Give each team a heart pillow. The first player on each team will place the pillow between their chin and neck and pass it to the next player. Players cannot use their hands or teeth, they are only allowed to use their heads to pass the pillow. If a player breaks that rule, his or her team must start over. The game continues to the last person in line and then reverses so that the pillow back is going back to the first player in line. The first team to successfully finish the game wins. This Valentine's Day toss game is really easy and fun! There are six inflateable arrows and one inflatable heart shaped ring included in the game. Each player get a turn to throw the arrows at the heart shaped ring. If you are playing the game with small children, they can stand close to the target while older ones can stand further back. Add a fun twist, if you'd like, by having older children stand on one leg while throwing or have one hand behind their back. The player who scores the most points (by landing their arrows in the heart) wins a prize! This game is available through Amazon. Fill an area with heart shaped balloons and lt the children go wild, seeing how many they can pop by sitting on them. The child who pops the most wins. Let the children make paper puppets (directions in our Craft section). Once the puppets are made, hang a sheet between two chairs and let them take turns acting out a puppet show. You can even double the children up so the can let their puppets interact. Get the camera rolling as you might be shocked at how creative they can be! Bake up some cookies or cupcakes and let the children decorate them. Set out bowls of various colored frostings, sprinkles, candies and other fun edible goodies and let them have at it. They won't soon forget this activity and that's for sure! Let the children create from their hearts with these tried and true crafts. We have learned that the more organized craft time is, the better. Be sure to have the supplies neatly organized and above all, protect the area with a covering on the table and the floor as well. We have also learned (the hard way) to be sure the crafts we do at a party are age appropriate. It can be disasterous to have a project going that is too difficult for little artists and equally as big of a flop to get a craft going that is too easy and boring for older children. This project is a yummy and cute family favorite for sure. In fact, the one in the picture is one my two and five year-old grandsons made. Simply mix up a large batch of Rice Crispie Treats and let the kids shape "kisses". Give each child a large sheet of aluminum foil and help them wrap the foil around the "kiss". Let each guest take their "kiss" home. It makes a great gift to give or fun snack for later! This is a great craft for the younger ones. Print out coloring Valentine pictures like this Heart Bear. Use food coloring to tint rice and once it has dried, let the children glue it on the picture. You can also cut out shapes of art foam and do the same. Help the little ones glue on some googley eyes and a red pom-pom noses and each child has a beary nice project to take home. Purchase some inexpensive Valentine's Day coffee cups or, you can use a solid color like red, pink, blue or a pastel. Let the children fill them with Valentine candies like Conversational Hearts or Red Hots and then give each child 3 Valentine's Day suckers to stick in his or her cup. This craft is quick, easy and yummy too! This is a craft that both the younger and older children will enjoy! This kit from Amazon comes with all the foam and supplies the kids will need to make these paper puppets except the glue and crayons or paint if they are going add some extra touches. When the puppets are completed, let the children put on a puppet show! Check out the candy jars we made during craft time at our party! It's a very cute and easy project but the kids, no matter what age, will need to be supervised. You will need a mason jar for each child, some large bags of Conversational Hearts Valentine candies, a glue gun and some glue sticks. Help the children glue the inside of the lid to the screw top of the lid then help them glue candies to the top of the jar. While the glue is drying, the children can fill the jars with candies. That's it! The jars make a great gift for the guests to give someone or to keep for theirselves. Enjoy! Add tons of fun to your party when you let the kids dress up. These cute costumes will have the children seeing red...in a good way! Buy Costumes is an excellent source to get Valentine's Day costumes. They have great prices, excellent specials and a super selection. What about this infant costume for your little angels devil side? The "Here Comes Trouble" costume includes: a lined zippered bodysuit featuring a satiny red/white heart, shiny devil tail and an inner leg snap closure, horned hood with attached marabou halo, and skid resistant booties. Plus, a detachable gleaming angel/devil wings are also included in this daring and divine ensemble. Join in the fun yourself. Watch the children's faces when they see you in a Cupcake costume. They will surely think you are just the sweetest! Don't forget your pup! Buy Costume has pet costumes too so make sure the four legged sweetheart of the household is dressed for success too. Isn't this the cutest cupcake costume ever? When the party is over, send the guests home with much love! Parting is such sweet sorrow but not when they leave with the funtastic favors. First, you will want to decide what you want to put the treats in. Options include theme sacks, boxes, baskets and even heart shaped containers. Once you choose a container, you will know how many items will fit inside. Filling them is the fun part. When it comes to the Valentine's Day Party theme, the possibilities are endless. Include toys like balls and bubbles and treats like coloring books and heart shaped sunglasses. Don't forget to add plenty of candy like these personalized ones. Here are some great ideas from Celebrate Express. You can get special things at a party store and grab some things at a dollar store or bargain rack to mix in. Amazon has some great party favors too and often you can get a discount on shipping or even get it free with Super Saver Shipping. Since Valentine's Day falls shortly after Christmas, my sister taught me a fun trick. When the bargain bins are full of Christmas items after the holidays, scoop them up. You can use red things for Valentine's Day, Fourth of July celebrations and even for birthdays. Red paper goods like plates, cups and napkins are all up for grabs and often things like red cake sprinkles, wrapping paper and table covers are too. Might as well grab some green things to because you are in luck..we have an amazing St. Patrick's Day Party too. There you have it, our tried and true Valentine's Day Party innovative ideas and creative contributions... straight from our family's heart to your own. We hope you can take some of our suggestions and add in your own touches for a lovely and fun party. So sit back and get reddy to be tickled pink. We have done all the work for you and would never leave you blue. Remember...We are here so you can wholeheartedly seize the moments and enjoy your big day.